How does one describe “awesome, wonderful, terrific, inspiring, fun” and more? 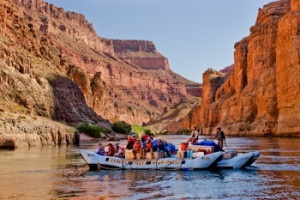 Our trip in the Grand Canyon from Mile 0 on the Colorado River at Lees Ferry to mile 188 at Whitmore Wash over 5 nights was nothing less and a lot more of the thrill described by others. Our Travel Agent provided us the confidence to contact Western River Expeditions. From the first call to the post-trip contact, Western's services, kindness and care have been exceptional. The easily navigable website with pictures, videos, instructions, lists, contacts and security concerns were spot on. Don’t second guess them. On our tour, every person we came in contact with knew why we were there, where we were going and concerned about our welfare from the hotel to bus transport to the airport connection to meeting our guides to the helicopter put-out and back to the hotel to pick up our left behind luggage. We saw 2 helicopter evacuations from other groups on the trip, this is included in your costs. It is suggested to bring neoprene socks and gloves on trips before May; I would recommend a wet suit as well to be comfortable! 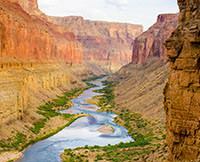 The Colorado River is snow-melt and is 45 degrees. While the sun maybe 100 degrees, the shaded areas of the river could easily fall to 60 degrees. Otherwise, wear more than 2 layers and a proper rain suit. Buy a proper water proof camera. Don’t use a camera dry bag. Share this experience of running class 8-10 (Grand Canyon scale) rapids, flash flood waterfalls, gorgeous inside canyons, equally exciting rafting and camping partners, Grand Canyon history, clear Milky Way night skies with the other 7 billion souls of our planet. 4.5 million visitors see the great divide from the South Rim a year but only 25,000 get to experience the deepest accessible geologic canyon. My wife and I are adventurous and have enjoyed many other world wonders but this was special and Western River Expeditions made it happen with ease and security. Our guides, Kelly, Shad, Becky and Lane were well coordinated, happy, helpful, experienced and ready for anything. Several of us were held on the rafts as Class 10 waves tried to throw us off. Two extra outboard engines per raft were available and we used 2 of a total 3! The guides culinary skills and supplies were exceptional! The website is modest but don’t forget to add a proper tip to these well trained and prepared, fun-loving guides who are there to provide this ultimate experience for you. We look forward to other trips with Western!